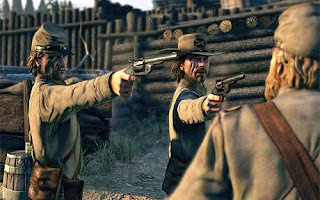 "worry-ye-not, fans of ponchos, big hats and spitting, 2009 just might be your year"
At last, a FPS game featuring Confederate deserters who head off to defend their home in Georgia and end up being chased through the greatest cliches of the Wild West. With Gatlin guns to boot. How to summarize? This review captures the essential script: "Call of Juarez: Bound in Blood tells the story of how Ray McCall -- the bible-wielding, gun-toting psychopathic Reverend from the first game- goes from Confederate soldier to man of the cloth by way of outlaw. Beginning in the fire and brimstone of the American Civil War trenches, Ray and his younger brother Thomas desert the Southern army in order to return home and protect their family. This leaves their psychotic commander, Barnsby, desperate for blood, pursuing Thomas and Ray -- along with youngest brother, Priest William -- across the country." It's not your father's video game. That would probably be Pong. Read all about it here. Did President Grant really visit Palo Alto in 1877? or is it similar to claims that "Washington slept here"? I went for a walk in the neighborhood the other night, specifically to get a picture of a historical marker about 1/4 mile from my apartment. In 12 years here, oddly enough, I never got around to visiting this marker until this week—odd, because I am a little bit obsessive about seeing every marker I pass by, or am in proximity to. In fact, I thought it was on another block of La Selva, probably hidden from easy view, and never took the time to investigate further. Some articles, like this one in "California Historian," state that Wallis "entertained President U.S. Grant there in 1877." Grant would have left office in March of 1877 (inauguration in those days did not occur until around March 20), so I assumed a visit would have occurred in the early months of the year. It did not dawn on me right away that, of course, even after he left office people would still refer to him as "President" Grant. There is also the fact that Grant left for a European tour soon after leaving office, which narrows the window for a West Coast visit still more. I spent a good deal of time last night searching digital archives of early California papers, in particular the Daily Alta California, and the Daily Call, which, it seems, almost certainly would have recorded a visit by Grant to the Bay Area in 1877 (given the amount of reporting on Grant in general). I also searched my limited personal library of Grant-related material for any mention of a Mayfield visit. My cursory searches yielded nothing. By chance, yesterday I commented on Kevin Levin's blog entry about his reading of a new work on Grant, Joan Waugh's, U.S. Grant: American Hero, American Myth. Specifically, I asked Kevin if Waugh's work spends "any time on women’s support for Grant in 1872 (Susan B. Anthony was arrested after voting for him him that year)? I’m looking for references to President Grant’s visit to the West Coast at the tail end of his 2nd term, when he apparently met with California suffragette Sarah Wallis." Intriguingly, this prompted a response from one Bob Pollock, a ranger at the Ulysses S. Grant National Historic Site: "David, Your question has sparked interest among the park rangers here at Ulysses S. Grant National Historic Site. 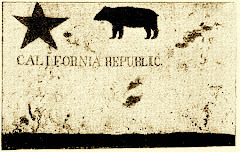 We are not aware of a trip by Grant to California in 1877 and it seems unlikely. He left office in March, and boarded a steamship at Philadelphia in May to go on his around the world trip. It seems more likely that if he met Sarah Wallis it would have been in 1879 when he and Julia conclude their travels by arriving in San Francisco. We are going to look into this some more." I'll address that here in the hopes that Bob will weigh in and help shed more light on the matter. My neighborhood historical marker just got a lot more interesting on this steamy June Saturday. Bob, my source for it is simply the marker itself (and one article), though I will now email the long-time historian for the neighborhood association in the hopes of uncovering something substantive. One encounters passing reference to Grant's visit in any number of articles, but I suspect they're all relying on the same source—probably the marker, or a database of marker text. 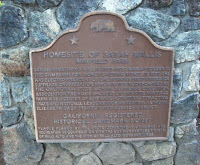 One contributor from the Palo Alto Historical Association avoided reference to Grant in his essay on Sarah Wallis. 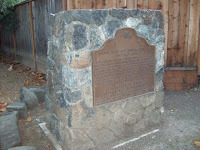 The aforementioned "California Historian" article specified the 1877 visit. Maybe that was just a typo. I hope we can establish Grant's visit to Sarah Wallis, a spectacular historic figure in her own right (more on her in a subsequent blog entry). The mansion Wallis built burned to the ground in 1936, and the area is now the quiet residential area of Barron Park. 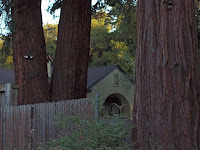 Few old growth redwoods remain, but a few of those magnificent trees in the neighborhood appear to be old enough to have witnessed a visit by the old general. 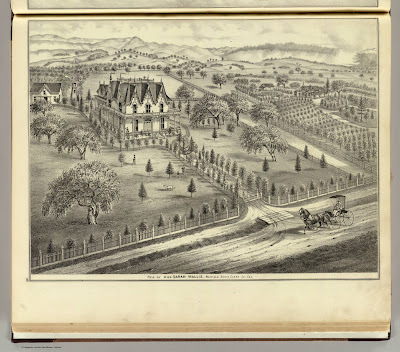 (image at top is entitled "Res of Mrs. Sarah Wallis, Mayfield, Santa Clara, Co., Cal., from the David Rumsey Map Collection. Mayfield is part of what makes up Palo Alto). 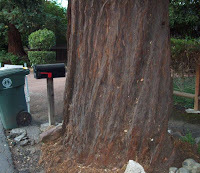 Just for fun, visit this 2006 blog entry on a California tree named for General Grant (along with the Lincoln and Sherman trees). Before Wolf Blitzer was interviewing holograms, before news apps for the iPhone, before Twitter, there were just newspapers. 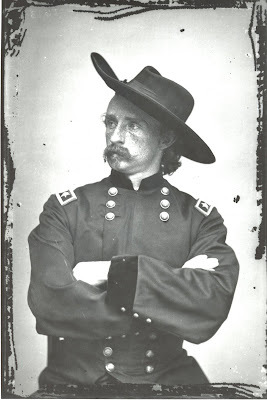 George Custer, "the boy general" of the Civil War, was 36-years-old when he overreached on June 25, 1876, on the eve of the nation's centennial celebrations. Two newspapers broke the story, the Bismark (Dakota Territory) Tribune, and the Helena (Montana Territory) Herald. Marcus Kellogg, a correspondent with the Tribune, was "embedded" with the Seventh Cavalry, and killed along with Custer's men. The last dispatch he sent, dated June 21, included this update, "We leave the Rosebud tomorrow. . .and by the time this reaches you we will have met and fought the red devils, with what result remains to be seen." 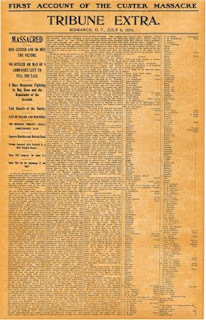 The famous headline in the special edition of the Tribune on July 6 reported: "Massacred: Gen. Custer and 261 Men the Victims." According to the paper, "The body of Kellogg alone remained unstripped of its clothing, and was not mutilated" (other sources describe his corpse as scalped, and missing an ear). This 2,500-word account, incorporating Kellogg's notes, was the first fully-detailed reportage. Consider that. Ten days passed before the premier newspapers in the East were reporting the story. By contrast, events during the Civil War, from far-flung battlefields, could be telegraphed nearly instantly. The first trans-continental telegram was sent from Sacramento to Washington in 1861, 15 years before Custer's last stand. But reporting from Montana was another "story" altogether. It was a journalistic black hole. Five days after the battle, the steamboat Far West, loaded up with wounded, Kellogg's notes, and Myles Keogh's horse "Commanche" -- sole survivor from Custer's contingent -- began the 700-mile river journey to Fort Lincoln at Bismark, North Dakota. The Far West arrived with news of the battle on July 5th, and Tribune editor Clement Lounsberry went to work on the story. According to the State Historical Society of North Dakota, "there was only a single telegraph line between Bismark and St. Paul at that time, and the only way to keep the line open was to keep transmitting. So, whenever Lounsberry fell behind, he had the telegraph operator transmit lines of scripture from his pocket Bible. It reportedly took Lounsberry and the operators 24 hours to finish, and the total bill for the transmission came to more than $3,000. 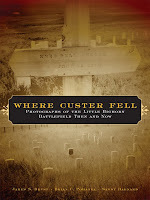 The following day, the New York Herald ran a 14-column story about Custer's demise." "Seven Civil War Stories You Didn't Learn in High School"
I went to high school in Iowa, and I have to confess, I can't recall studying the Civil War at all. I'm sure we must have somewhere along the line, but most of what I learned about that era came from my own reading of books lying around the house. Specifically, some American Heritage volume or another, various Bruce Catton books, and probably something by Henry Steele Commager. 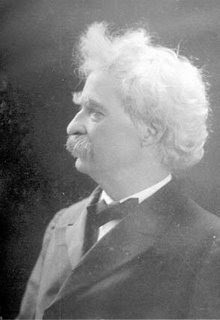 I’m virtually certain, however, that we read Mark Twain’s, “A Private History of a Campaign that Failed” in the classroom [a few years ago I posted a blog entry on that brilliant piece here, with a link to one online version of the story]. High school history covers a lot of ground in short order, but trivia has it's place. If my teachers had employed a few more attention-grabbers, I might actually have some memory of those classes. These days, anyone who reads a good single-volume history like McPherson’s, Battle Cry of Freedom, will come across pretty much everything on the list above: ill-fated colonization efforts, the bread riots, Lowe’s balloons and early submarines, the roots of Dixie, or that some females passed themselves off as males and melded into the ranks. These aren’t secrets, just things that require more reading. 1. The fledgling Confederacy engaged in a number of overtly hostile acts of war against the United States (seizing shipyards, arsenals, and installations, along with some U.S. soldiers) long before Lincoln sent ships to re-supply the garrison at Fort Sumter, leading to the "first shot" of the Civil War. 2. The extent of the damage and depredations wrought by Sherman’s bummers on the March to the Sea was greatly exaggerated in post-war tradition. During the same period, Confederate authorities in Richmond received angry complaints from citizens of Georgia over depredations by Confederate cavalry operating in the same areas. 3. On the day after Christmas, 1862, U.S. authorities engaged in the largest mass-execution in the nation’s history when 38 Sioux Indians were hanged (this after President Lincoln commuted the sentences of over 250 others). Texans may hold the record, however. In October of that year, 40 suspected Unionists were hanged, and two were shot. See blog entry on an ugly 10-week stretch of 1862 here. 4. The Confederate Constitution was nearly a verbatim copy of the U.S. Constitution, though it restricted the president to a single, six-year term, and gave him a line item veto. The C.S. Constitution also prohibited states from interfering with slavery even within their own sovereign borders. Curiously, abolition was an exception to state rights. 5. When in 1866, momentum was gathering in Washington to indict former Confederate General George Pickett for war crimes (the mass execution of deserters in North Carolina who had joined Union ranks), Pickett appealed to Ulysses S. Grant. Grant personally interceded with President Johnson on Pickett’s behalf, forestalling any charges or an arrest. 6. For the Five Civilized Tribes in the Indian Territory (Oklahoma) – the Cherokee, Choctaw, Chickasaw, Creek, and Seminole – divided loyalties led to a war-within-a-war pitting mainly mixed-blood, slave-owning factions against mainly full-blooded tribal members, devastating the nations for generations. 7. The deadliest maritime disaster in American history remains largely unknown and obscure. Something over 1,700 recently-released Union prisoners of war, en route to their homes on the steamship Sultana, died in the fiery explosion of that ship’s stressed boilers, or drowned in the Mississippi near Memphis, Tennessee in the middle of the night. What Seven Stories come to mind for you? Putting one's money where one's mouth is. 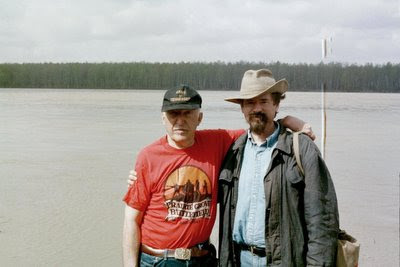 . .
On this day, four years ago, we lost one of the best and most devoted historians of the American Civil War, Brian Pohanka (seen at right, above, with legendary Civil War historian and guide, Edwin C. Bearss). Brian was merely 50-years-old, and at the height of his powers, with myriad projects in the works and untold numbers of them yet to begin. His storied career is recounted in this Washington Post obituary. For all of Brian's work on Civil War subjects, I was most fascinated and excited by his research, and his comprehensive grasp of events along the Greasy Grass in 1876. I love the book, Where Custer Fell, and selfishly regret that I never got to visit the Little Bighorn in company with Brian. Several people and I—good friends of Brian's like Paula Gidjunis and Keith Young—had spoken of hiring Brian for a private trip to Montana. Pohanka’s generosity to battlefield preservation was unequalled. In addition to the $1 million bequest, he and his wife Cricket quietly donated an equal amount to CWPT in 2004. 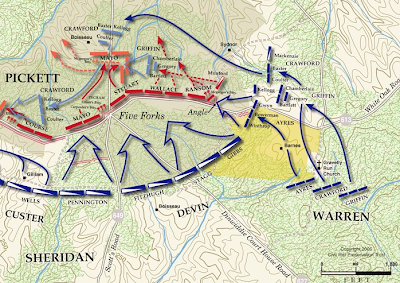 Over the years, Pohanka gave generously to both CWPT and countless other local battlefield preservation groups—in his will, he also set aside money for the Central Virginia Battlegrounds Trust ($500,000), the Richmond Battlefields Association ($500,000), and the Save Historic Antietam Foundation ($200,000). The newly revamped website for The Civil War Preservation Trust has a beautiful, all-in-one map page, featuring their outstanding topo maps, numerous historic maps, and some really spectacular animated maps that allow you to toggle between modern aerial and topo maps (the animated Chantilly map offers a 1937 aerial view as well). 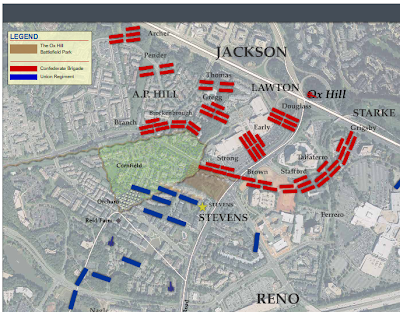 Additionally, there are links to some of the best sites to find Civil War maps online, like the Virginia Historical Society. Be sure to have a look at the animated Cedar Creek and Belle Grove map. If you thought the damage done by the Middletown Quarry had been mitigated by earlier agreements, think again. The proposed expansion of operations there (given the green light by local government) will increase the loss of prime battlefield land exponentially.